2011 Cure Alzheimer's Run Blog: Seaside, OR! Thinking of you as I go for coffee...Go Glenn! I heard about your run through supercub.org. 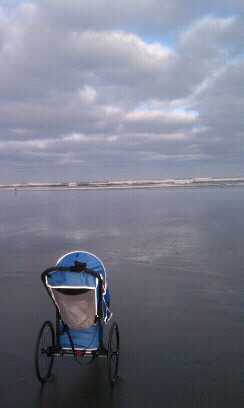 That's one great picture of the stroller at the beach. OMG. I feel like I am there, same weather, but I also feel the excitement and the rush. Maybe I have endorphins after all! Be safe, be smart, and believe. Hi Glenn! I am using all of my best Wellesley Scream tunnel training to cheer your on! GO GLENN GO, YOU CAN DO IT!!!!!!!!!!!!!! Good morning Glenn! Hope you have a great day. All the best Glenn. We're all thinking of you. Glenn, this photo is gorgeous. Really. Bee, you've made the paper twice here in Wallingford. Its amazing what 1 man can do! Have a safe run. We'll be routing for you here.